Shopping enthusiasts will be very familiar with Camberwell for its hugely popular rotary market, a treasure trove full of vintage and second-hand goodies. But there’s a lot more to Camberwell than just the Sunday market. Locals are spoilt by choice by the new wave of funky eateries and coffee shops opening around this Eastern suburb. From coffee hot spots like Prospect Espresso and Collective Espresso to the newly opened Legacy Camberwell, here are some tips for the area which should keep your hunger pangs away for months to come. Just a stone’s throw from Camberwell train station, Collective Espresso is the perfect place to get fuelled up before a shopping trip to the Camberwell market. Coffee is superb here – they use Five Senses beans and a rotation of single origins. The eclectic breakfast menu offers house classics like the ricotta and raspberry hotcakes, smashed avo and a great build your own breakfast option. Space may be minimal, but they sure make up for it with charm and character. Another great spot for specialist brewed coffee is Prospect Espresso, just off Burke Road on Prospect Hill Road. Serving coffee from Rosso Roasting Coffee Co beans, these guys pride themselves in their consistently good coffee and sourcing ethical produce. The brunch menu is short and sweet, with mouthwatering treats like chocolate ganache filled hotcakes, truffle scrambled eggs and warm coconut rice. I’m getting hungry just thinking about it. One of Melbourne’s oldest milk bars, Fordham’s Milk Bar also doubles as one of Camberwell’s hottest brunch spots. To keep its history intact, the milk bar sells all the usual cartons of milk, chocolates and lollies but the real magic happens in their kitchen. The all day breakfast menu is full of delicious treats like freshly made banana bread, Mrs Fordham’s French toast, sweet potato rosti and Middle Eastern fried eggs. If you’re in a rush they also have plenty of take home options. One of the newest additions to Camberwell’s brunch scene is Legacy. There’s plenty of healthy options for superfood nuts, like the dragonfruit or acai power bowl and the buckwheat superfood porridge. For drinks, try one of their raw superfood infused smoothies. But if you’re looking for something a little “meatier” there’s plenty of comforting options to bite into like the fried chicken burger and the pulled pork eggs benny. Don’t go home without trying one of their doughnuts. If you’re looking for a gluten free breakfast, make a bee line to Red Robyn. Here all the dishes are 100% gluten free and packed full of creativity and taste. They also cater for a wide range of other specific allergies including fructose, lactose, dairy and eggs. The owner herself,Robyn Metz, is gluten, fructose and lactose intolerant so knows the difficulties associated with food allergies. She opened Red Robyn to offer a diverse range of delicious dishes to allergy sufferers. Expect creative twists on typical brunch classics including banana bread French toast, a rainbow coloured breakfast stack and baked eggs. Of course dairy and non-dairy coffee options are also available. For a piece of Greece in Camberwell, venture to Elyros restaurant on Burke Road. The Cretan inspired menu features a nice range of mezze and larger dishes. 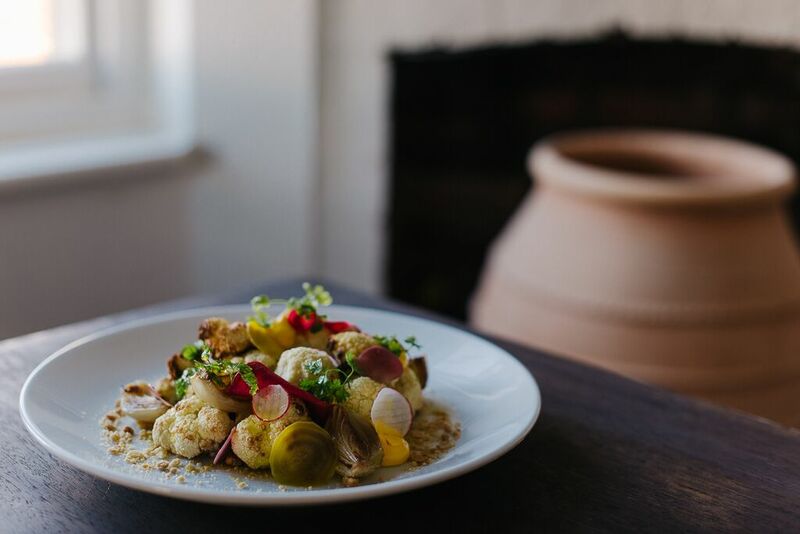 Think tarama butter calamari with horta and grilled fennel or a succulent sticky lamb with leeks and feta. Elyros is dedicated to sustainable produce; all of their meats are free-range and grass fed, greens are foraged or locally farmed and their seafood fresh at its best. The tasting menu at $64 is exceptional value for a special occasion. Rumour has it, Elyros serve one of the best lambs in Melbourne. One thing Camberwell doesn’t have dozens of, and that’s quality bars. Lucky for locals, Bar None opened in 2004, delivering beautifully crafted cocktails. This hidden gem next to Camberwell train station is full of character with its big cosy couches and welcoming service. The bar menu is reliable too – with some great options including a reuben sandwich, antipasto and cheese platter. Sweet tooths will love the Provence Artisan Bakers in Camberwell. The counter is always packed full of luscious French pastries, quiche lorraines and lemon tarts. They also sell a great range of bread. Don’t forget to grab a coffee to go! On Sundays, join the locals and antique collectors at the Camberwell markets where you can find everything under the sun. For the best deli treats stock up at Monaco’s Continental Delicatessen and Food Store or the Tasmanian Grocer for the best cool climate and wild caught produce.